Alarming levels of sugar and calories are hidden in milkshakes sold across high street restaurants and fast food chains – according to a NEW survey by Action on Sugar, based at Queen Mary University of London. Family restaurant Toby Carvery is ranked as the most ‘shocking shake’ with its ‘Unicorn Freakshake’ containing an alarming 39 teaspoons of sugar – that’s over six times the recommended daily amount of sugar for a 7- to 10-year-old. The next worst offender is Five Guys Banana and Chocolate Shake with an excessive 37 teaspoons of sugar - the equivalent of drinking over four cans of cola. When it comes to hidden calories, Public Health England’s sugar reduction targets include a cap on milkshake products likely to be consumed in a single occasion to 300 calories. However, a milkshake such as Toby Carvery Unicorn Freakshake at 1280 kcal per serving is more than half the daily-recommended amount of calories for an adult and four times PHE’s proposed calorie limit. An average 25-year-old would need to jog for nearly three hours or vacuum the house for five hours to burn off the calories! This new research concludes that ALL products sold in high street restaurants and fast food chains, with nutrition labelling available online, would receive a ‘red’ (high) label for excessive levels of sugar per serving. To mark its 3rd National Sugar Awareness Week (12-18th November 2018) supported by many charities and high profile advocates including Tom Watson MP, Davina McCall, Fiona Philips and Hugh Fearnley-Whittingstall, Action on Sugar is now calling for mandatory traffic light coloured nutrition labelling across ALL menus, while the UK government is consulting on menu calorie labelling. Furthermore, the group of leading experts is calling for a ban on the sale of milkshakes that exceed a calorie limit of 300 kcal per serving. This contrasts with Public Health England’s ambition to achieve only a 10% reduction in sugar by mid-2019 and a further 10% by mid-2021 to meet the 20% overall target, which will still leave these milkshakes with vast and unnecessary amounts of sugar. * Some of the sugars will be from the milk but current nutrition labelling does not differentiate between the amount of naturally occurring sugars (lactose) from milk and free sugars added in the form of table sugar, syrups and blended fruits. **Five Guys ‘Create your own’: for the purpose of the survey, the following mix-ins were chosen. However, nutrient content significantly differs depending on the combination chosen. Action on Sugar also investigated the sugar and calorie levels in milkshakes sold by supermarkets and found that 90% of the 41 products surveyed would receive a ‘red’ (high) label for excessive levels of sugars per serving as sold. Of note, two contain no added sugars and all the sugars in those products are from milk. Overall, supermarket milkshakes are much lower in sugar and calories per serving. 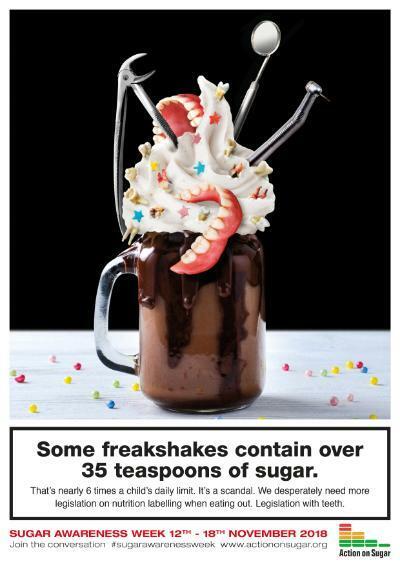 Toby Carvery Unicorn Freakshake has 17 times the amount of sugar as a Yazoo No Added Sugar Strawberry 200ml which contains 9.2g of sugars per serving. Graham MacGregor, Professor of Cardiovascular Medicine at Queen Mary University of London and Chairman of Action on Sugar explains, “Despite milkshakes being incorporated into the Public Health England’s Sugar Reduction Programme as part of the government’s childhood obesity plan, it is clear from our survey that much more needs to be done than a 20% reduction. These very high calorie drinks if consumed on a daily basis, would result in children becoming obese and suffer from tooth decay - that is not acceptable. Dr Linda Greenwall and charity founder of the Dental Wellness Trust says, "These findings are remarkable, especially given tooth decay among children in Britain is now at a record high, largely because food and drink products are packed with unnecessary sugar. “As the number of youngsters admitted to hospital to have their teeth extracted continues to escalate at a cost of more than £36million to the NHS, manufacturers, the out of home sector and parents must take immediate responsibility by significantly reducing the amount of sugar given to children, as well as enforcing daily brushing to reduce the likelihood of tooth decay." Action on Sugar is a group of specialists concerned with sugar and its effects on health. It is successfully working to reach a consensus with the food industry and Government over the harmful effects of a high sugar diet, and bring about a reduction in the amount of sugar in food and drink products. Survey details: full survey sorted by highest sugars per serving attached with this release. For this survey, ‘flavoured milk’, ‘milkshakes’, ‘shakes’ and ‘freakshakes’ refer to drinks that are dairy-based, chilled or ambient, sold by fast-food chains, restaurants and supermarkets and intended to be consumed in a single occasion. ‘Freakshakes’ or ‘Ultimate shakes’ contain additions of cream, sauces, biscuits and confectionary and/or cake. A total number of 140 products from 14 chains were eligible from high street restaurants and fast food chains with at least 20 outlets. Of these chains, 8 (Burger King, Five Guys, Gourmet Burger Kitchen, Harvester, KFC, McDonald’s, Pizza Hut and Toby Carvery) had nutrition information available online per serving. The nutrition information of 46 products were included in the survey. The 6 (Byron, Creams, Ed’s Diner, Frankie & Benny’s, Handmade Burger Company, TGI Fridays) that did not have nutrition information available were contacted via email or phone to confirm the lack of publicly available information. A total number of 41 single serve drinks (≤400ml) were surveyed from supermarkets – Waitrose, Marks & Spencer, Aldi, Lidl, Co-op, Morrisons, Asda, Tesco, Sainsbury’s). Where possible, data were collected in store (supermarkets) or online via the websites (fast-foods chains and restaurants). Hot flavoured dairy drinks, milk substitute drinks (non-dairy, protein/fitness/recovery shakes, coffee-based drinks, yoghurt-based drinks, ‘hard shakes’ i.e. milkshakes containing alcohol and milkshake powders and syrups sold as pre-mixes from supermarkets.